Each year, each of us head to office supply stores, Target or teaching resource stores, with the shopping dilemma: What will make my classroom function more efficiently, versus What’s just a waste of money? Today’s post is a pictorial sharing 5 back-to-school, classroom supplies that I loved enough to go around photographing! Each of these proved itself an asset to the students and myself throughout the full year, contributing to our classroom community, student organization and our ability to reach our goals — and each was resilient enough to be reused again this year. Between teaching and parenting and keeping a home office, there are 2 supplies that have most consistently failed: staplers and electric pencil sharpeners. I had tried (to the death) 3-4 pencil sharpeners before this one won my heart. Let my experience be to your benefit as I can testify that this is the only pencil sharpener that has (1) sharpened fast and effectively, (2) performed consistently and (3) this is key: did not die, jam or otherwise self-destruct. 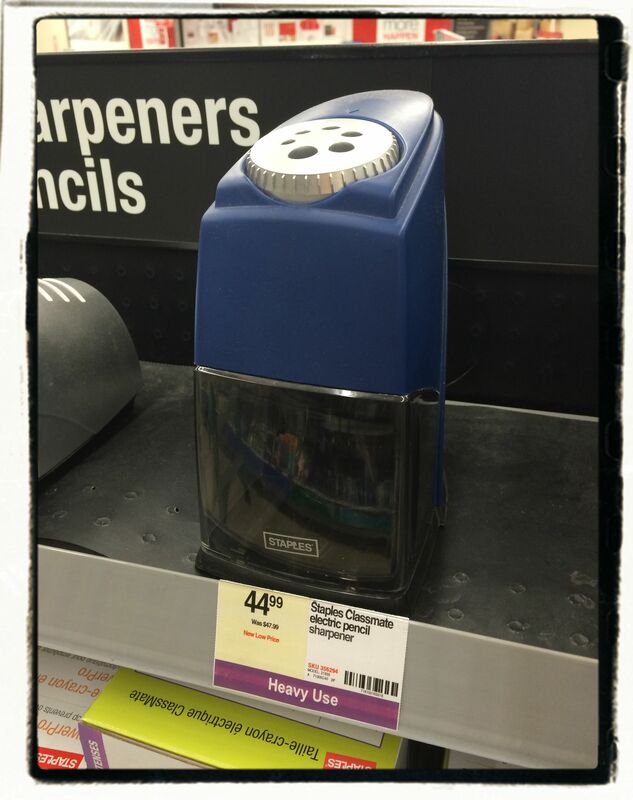 Purchasing info: Staples ClassMate Heavy Duty Electric Pencil Sharpener (blue). Pictured on the shelves at Staples in July, with a lower price than currently listed online ($51.79). In my home office and in the classroom, I am neurotic about keeping binders rather than file folders. I frequently have students hole-punch work to maintain for reflection or reference throughout a unit, as well. Binders keep things neat, accessible, in order and revisable — which helps students and myself make the most of our printed materials. A 3-hole punch isn’t hard to find — but one that cuts reliably, holds up to repeated use (including by impatient students) and can do multiple pages with little hand stress… is worth getting excited about. 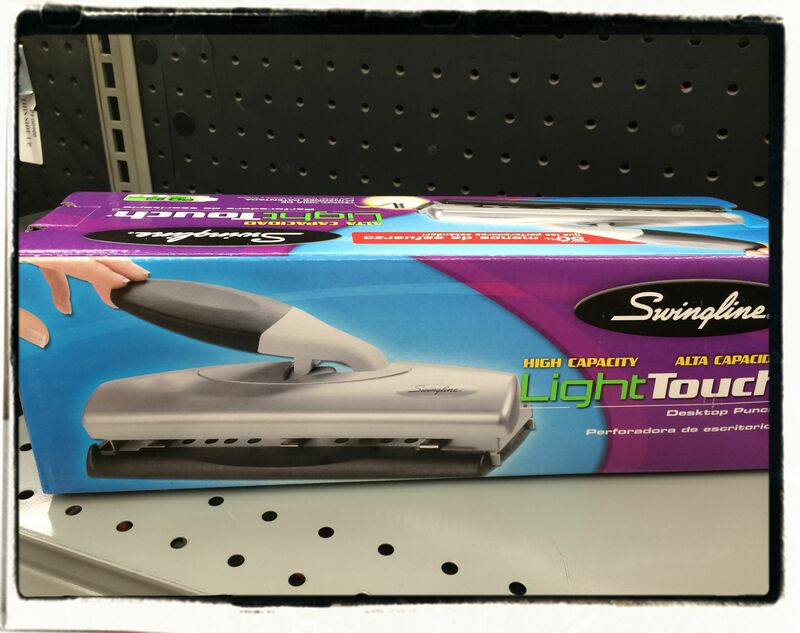 That’s why I fell in love with the Swingline High Capacity Light Touch. With 20 lb./12 page capacity, it really does cut through pages cleanly with little effort — and it stood up to a year’s pounding in the classroom, still ready to go. It’s worth noting that “light touch” is huge benefit in hole-punching, as it’s easier to keep pages lined up (avoiding those mis-punches that run off the edge of the page) if the user isn’t having to pound to cut through. Purchasing info: Pictured in its box on the shelves at Staples (current price: $29.99). Also available from Amazon (current price: $19.97). I am big on fostering a tribe-clubhouse spirit within my classroom, and one thing the students love most is the mobility provided by our classroom clipboards. Not necessarily a new idea. But…here’s my nerdy thing: I think our class enviro is more fun when things are cute. I bought about a dozen decorative clipboards from ecofriendly collections available at Staples and Target. We had each of the sport and animal patterns pictured at right (kitten, puppy, football, soccer) from the Staples collection, as well as several attractive graphic patterns like the one at left, and some pretty, graphic florals (from Target Greenroom). The kitten was most popular, even after he’d been edited to sport a curly mustache by one of my doodlers. Organization tip: I kept clipboards available in my “student station,” standing on end in an inexpensive ($2) bin from Target’s dollar section. 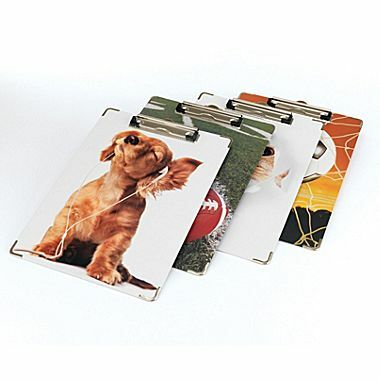 Purchasing info: the sport and animal designs (pictured at right) are from Staples – Staples Fashion Clipboards ($3.99 each). Floral and graphic pattens are available at Staples (the blue and green clipboard at left, with matching desk supplies) and at Target. 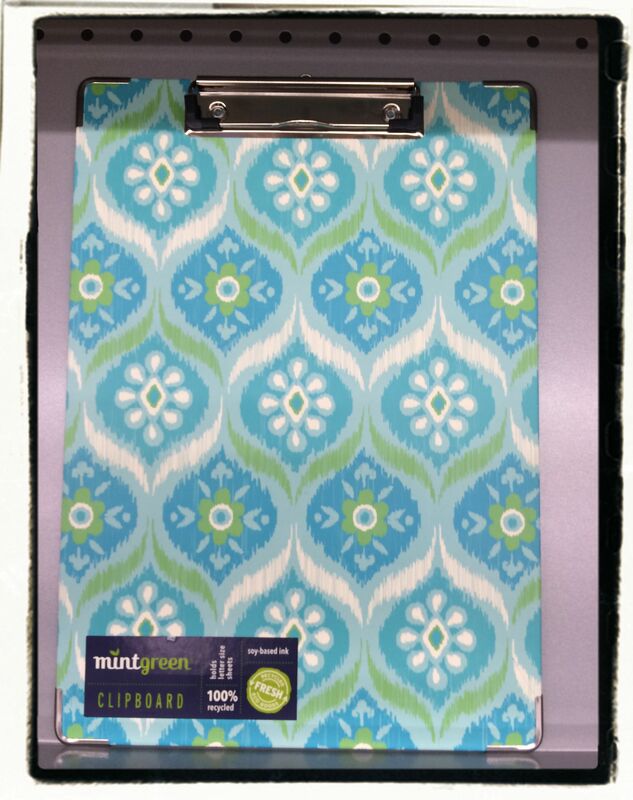 Target’ Greenroom prints and florals are quite cute and can be purchased in stores or online: Greenroom Eco Clipboard Assorted Patterns (product numbers: DPCI : 081-05-1608; Online item # : 13460045). Pricing is comparable for all 3. 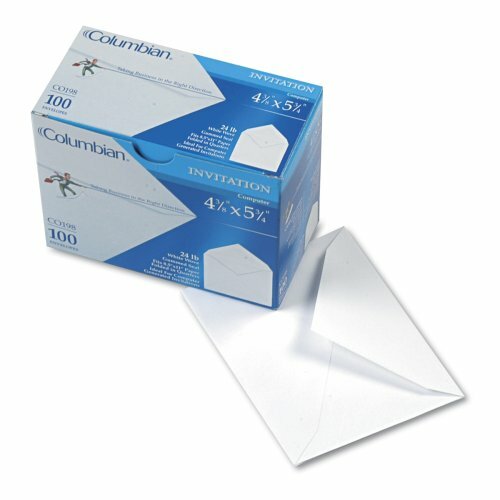 Staplers, pencil sharpeners, hole-punches, even clipboards… I get the point of all of these — but why envelopes? One of my favorite new adaptations this last year were interactive notebooks. For reading, history, science, vocabulary — any notebook where students might be taking notes — I did everything I could to help them make those notes interactive. They turned pages into flipbooks, illustrated notes, added flaps so notes could be studied as a game… it was awesome. One approach students liked was taping an envelope onto a notes page, which they could use as a pocket for flash cards, so we were in the habit of using an envelope for each unit. Students also used them for other interactive projects, like securing an imaginary letter onto a lapbook. They were a surprisingly handy supply to have. Purchasing info: the best tip might be to include “stray envelopes” as a request, if parents send in materials for recycling in the classroom. The envelopes I used were leftover from invitations my sons hadn’t used a couple years back, so essentially free. You might check recycling depots, if your community has those. 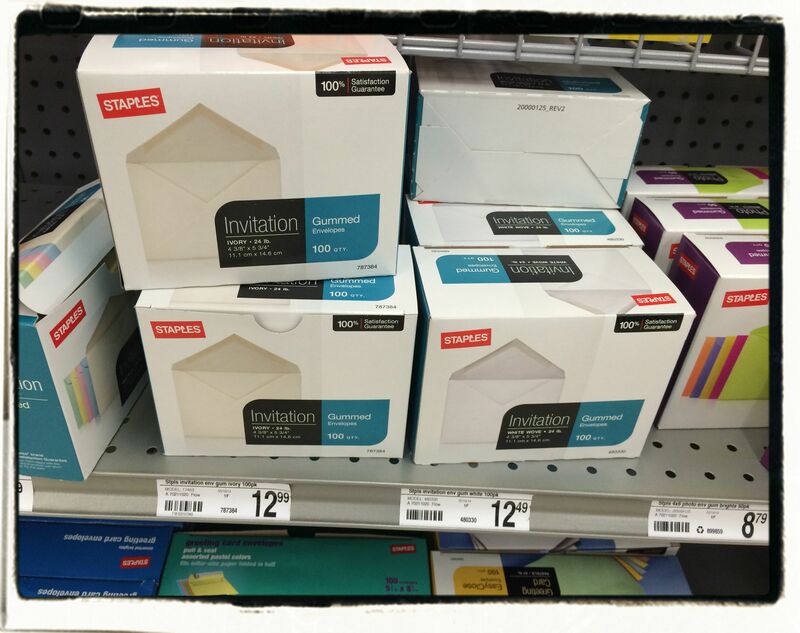 Otherwise, I wasn’t too set back by the price to buy a box of envelopes as shown here: At right, a box of 100 Columbian brand envelopes from Amazon (currently $7.45) or, pictured in the store at left: 100 “Invitation” envelopes by Staples ($12.95). One of my favorite purchases was this small white board. Why? Because, right by the door, whether students were on their way in or out, it told them what was due today (or due within the next couple days). 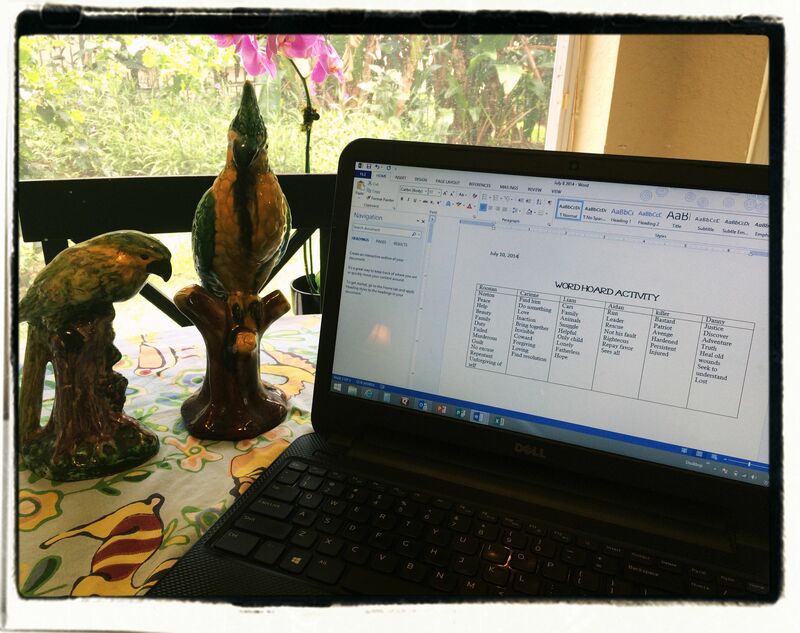 One of the biggest things middle schoolers are learning is to keep organized, and it is a big skill to manage not just start dates for projects but what to turn in, when. Separating this list from the assignment board helped underscore the “end zone” nature of turning things in. 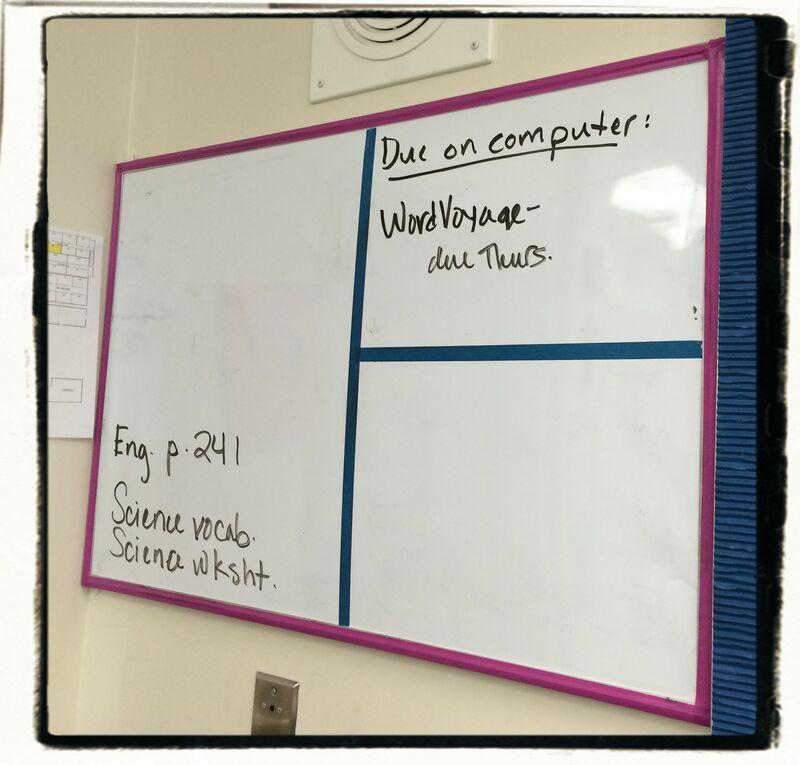 Don’t need a “due date” board? Other teachers on my hall had a small whiteboard for a quote of the day, question for morning meetings or daily goals (I’ll post about my daily goals board another day). Style & hanging tips: How cute are the stripes on my board? I dressed up the cheap board I bought using Washi tape in order to incorporate it with the adjoining board. This was a class-design spurge, that came in handy throughout the year (color-coding books, drawing lines on the board, covering unattractive surfaces). 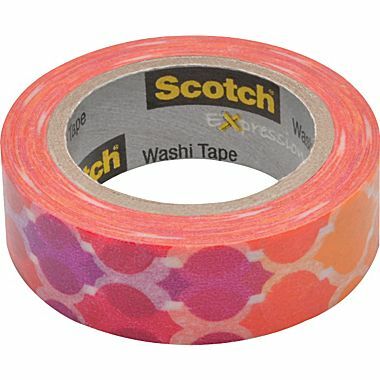 Mine was a splurge at $3.49/roll at Staples — although you can get it for much less via Amazon ($2 and less/roll, with variety of patterns and manufacturers). How did I hang the board without breaking my school’s “no nails” rules? 3M Poster hanging strips (I think 6 held it; $2.59-3.49), available at Target, most convenience stores or use the link to order from Amazon. Purchasing info: my board was by Board Dudes from Target ($19.99) — it made it through the year and is reusable, but is not my top recommendation. Mine was foam core and dented easily; stronger ones are melamine. More options: Costco: Quartet Dry Erase Board ($39.79), or Universal Dry Erase board from Amazon ($25.47). What are your favorite back to school supplies for getting your classroom ready? Today, I shared tools that helped my classroom run more successfully, but I know we can all wax on about our favorite borders or cutouts or bulletin board design or theme… (Last year, mine was zebra borders that matched these zebra puff-stools for our library corner!) Share your favorites or link to your own posts in the comments. You know everyone loves to hear other teachers’ ideas. If you like this blog, be sure to subscribe using WordPress’s follow option or via the email option. 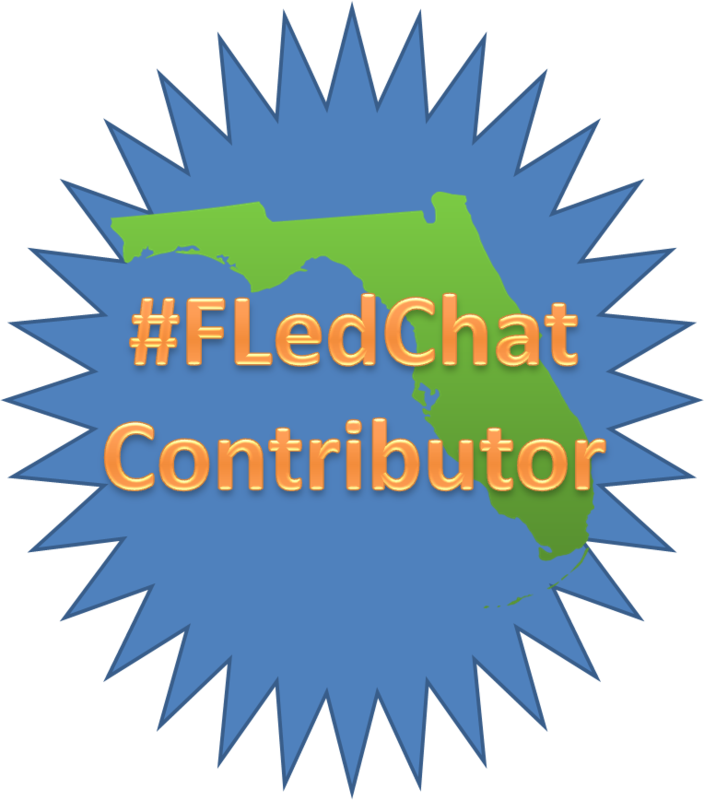 If you have a blog about teaching or writing, as well, leave a link in the comments. 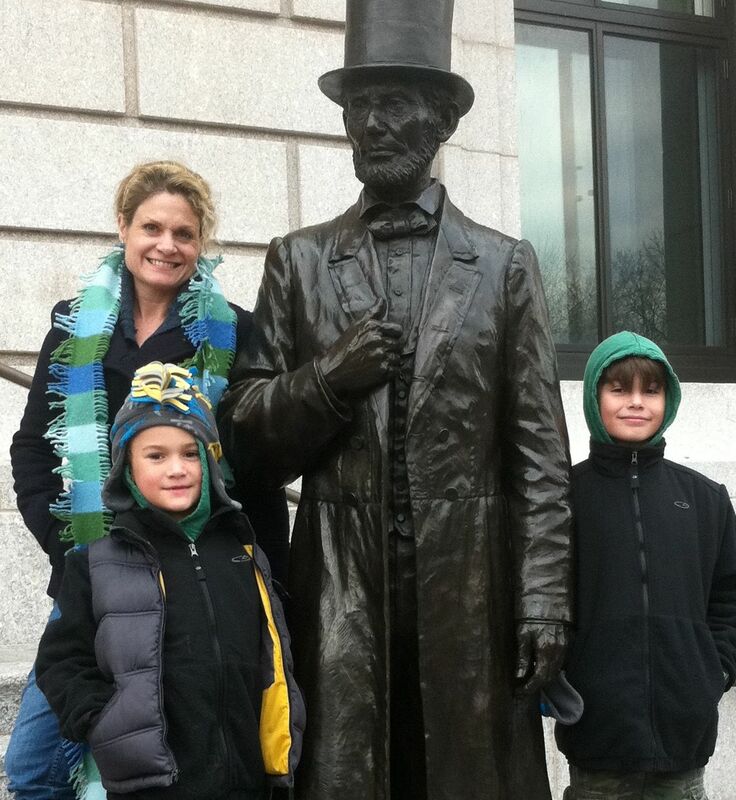 I love to connect with other educators and writers.